First appearing onstage at the age of 6, Jack spent the first part of his life in drama classes, high school productions and amateur theatre productions situated in his hometown of Wollongong, New South Wales. Since then Jack has studied Screen and filmmaking in 2006 and then went on the complete a Bachelor of Creative Arts majoring in Performance (Acting, movement, voice, stage and theatre-making) in 2012. He has performed with multiple theatre companies in plays and musical theatre and has performed as lead frontman for multiple rock bands. From 2012-2017, Jack co-produced and played leading role in the indie feature film "All Night Gaming" written and directed by Michael Cusack. 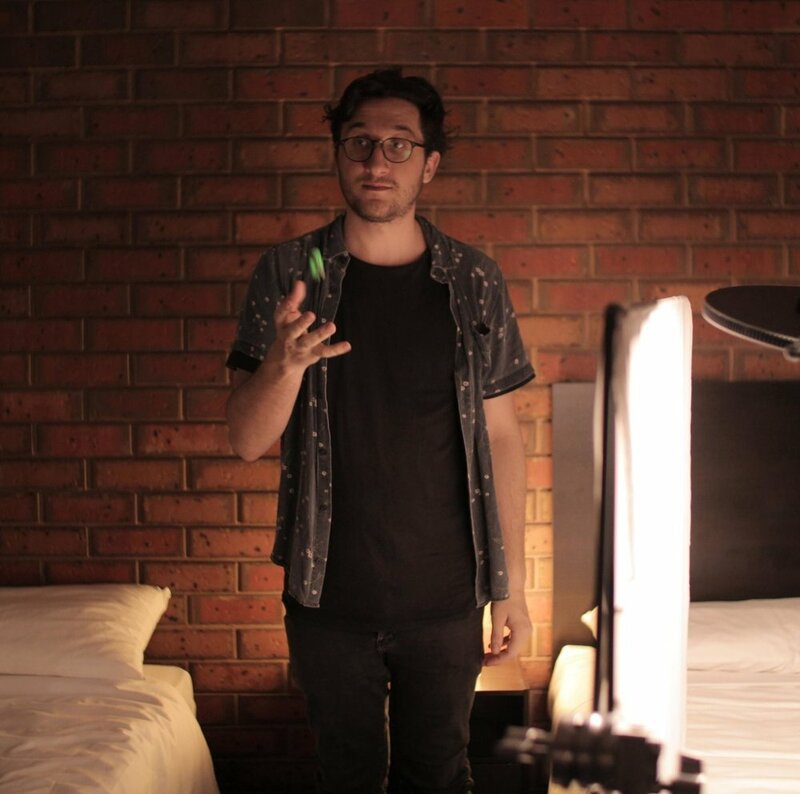 In 2013, Jack made his directorial debut with the short film 'Intrusion" which he also starred in and won the 'Best First Time Director' award in TopShorts Film Festival. Senie Priti is an actress, voice-over artist and writer. Her recent credits include, Dr Blake Mysteries (ABC), leading roles in indie feature films "Death of a Butterfly" (2019) and "Cerulean Blue" (2019). Priti has also starred in many short films, including award-winning shorts "Daughter" (Cannes 2016) and "Still" (2015). Priti's theatre credits include "Romeo and Juliet", "Tartuffe" and "The Importance of Being Earnest" among others. In 2014 Priti was the recipient of the Ian Potter Cultural Trust Scholarship for Talented Emerging Artists. In 2017 and 2018 she was a Finalist in the Beverly Hills Playhouse Hollywood Immersive Scholarship. Priti is also passionate about writing. She co-wrote award-winning short film "Shreds of Rainbows" (2013). She is currently writing and developing several projects going in to production later this year. Danae began in Brisbane undertaking a Bachelor of Creative Industries, Drama at QUT then with the National Theatre Drama School, Melbourne undertaking the 3 year Advanced Diploma of Acting (Completed 2014). Film & TV training with Andrew Gilbert & Danielle Carter. Vocal training with Les Cartwright, Anna Boulic, Jenny Kent & Nicholas McMahon Vocal Studio. Adrian Ortega was born and raised in Melbourne, Australia. After working in the industry as a freelancer, mainly in event videography, Adrian directed and produced documentary shorts, gaining over 75,000 views online and getting exposure with Vice Magazine (Thump channel), Channel 10 News and The Daily Mail in the U.K.. Adrian’s third documentary short “They Call Me Spiderman” was included in the program of The St. Kilda Film Festival in 2016, being in the Top 100 Short Films of that year. Adrian is passionate about telling stories from his own personal experiences and about people from his life, which was the sole inspiration for Cerulean Blue. Adrian’s film influences include The Coen Brothers, Martin Scorsese, Win Wenders, Vincent Gallo, Stanley Kubrick, Harmony Korine and Larry Clarke. Cerulean Blue marks Anthony's third feature film as cinematographer including ‘Death of a Gentleman’, a feature-length documentary that was filmed in England and India as well as Australia. Anthony has worked on countless short films, music videos, and TVC’s. Anthony’s focus is on achieving a visual voice for the projects he takes on. Michael is a screenwriter, director, editor and producer residing in Geelong, Vic. He discovered the art of film-making at a young age after finding and devouring a tattered copy of Filmmakers on Filmmaking edited by Harry M. Geduld. After completing his Advanced Diploma in Film and Television in 2011 , Michael travelled to the United States visiting Austin, Tx and Los Angeles, Ca, where he spent his time on the sets of various film and television productions (inc. True Blood, Criminal Minds). Having produced several of his own short films (Fuel Runners, The Future Kings, The Good-Looking One) he joined the production of “Cerulean Blue” as an editor and eventually producer following his contributions to the film during the post-production process. Michael is a big proponent for micro-budget filmmaking and is currently working on the script for his first feature film. Patrick grew up in the western suburbs of Melbourne where he met Adrian and most of the crew while at Footscray City Films, an independent TAFE in Melbourne's inner-west. He went on to work in the commercial advertising space having the chance to be involved in some award winning campaigns. Always wanting to be involved in the indie film scene, but never having the time to physically help, he started a small gear hire and production company. Now he regularly helps out local filmmakers with access to gear and resources while working on his own projects. This is the second feature film he has been involved in. Jack is a freelance location sound recordist and boom operator for film, TV and media productions. He graduated from Swinburne with a Advanced Diploma of Screen and Media. His film credits include Plague, The Neon Spectrum and West of Sunshine.